The Idaho Panhandle is the northern region of the U.S. state of Idaho that encompasses the state's ten northernmost counties: Benewah, Bonner, Boundary, Clearwater, Idaho, Kootenai, Latah, Lewis, Nez Perce, and Shoshone. Residents of the Panhandle refer to the region as North Idaho, though the southern part of the region is sometimes referred to as North Central Idaho. The Panhandle is bordered by the state of Washington to the west, Montana to the east, and the Canadian province of British Columbia to the north. 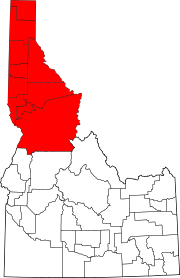 The Idaho panhandle is part of the Inland Northwest, although Idaho County is not always included. Coeur d'Alene is the largest city within the Idaho Panhandle. Spokane, Washington is around 30 miles (48 km) west of Coeur d'Alene, and is also the location of the regional airport, Spokane International Airport. Other important cities in the region include Lewiston, Moscow, Post Falls, Hayden, Sandpoint, and the smaller towns of St. Maries and Bonners Ferry. East of Coeur d'Alene is the Silver Valley, which follows Interstate 90 to the Montana border at Lookout Pass. The region has a land area of 21,012.64 square miles (54,422.5 km2), around 25.4% of the state's total land area; there is also 323.95 square miles (839.0 km2) of water area. As of the 2010 Census, the population of the Idaho Panhandle was 317,751, around 20.3% of the state's total population of 1,567,582. The Idaho Panhandle observes Pacific Time north of the western-flowing Salmon River in the southern part of Idaho County. The rest of the state to the south observes Mountain Time, which begins at Riggins. 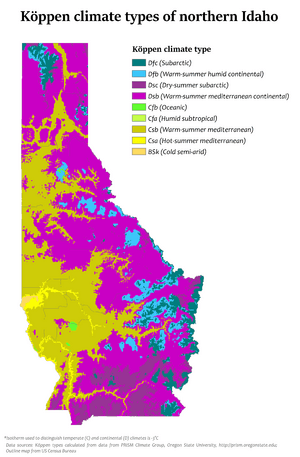 Though the Idaho Panhandle is at the same longitude as southern Idaho, the reasons for the different time zones are: (1) because Spokane is the commercial and transportation center for the region, and (2) there are many cross-border towns and cities that are connected, led by Spokane with Coeur d'Alene and Post Falls, followed by Pullman (home of Washington State University) with Moscow (home of the University of Idaho), and Clarkston with Lewiston. The Panhandle is isolated from southern Idaho due to distance and the east-west mountain ranges that naturally separate the state. The passage by vehicle was arduous until significant highway improvements were made on U.S. Route 95 in North Central Idaho (specifically at White Bird Hill, Lawyer's Canyon, Lapwai Canyon and the Lewiston grade) from 1965 through 1995. The American Automobile Association (AAA) separates Idaho into two parts, where the Panhandle is part of AAA Washington and the southern part is part of AAA Oregon/Idaho. North Idaho has a strong hunting culture. Residents are highly conservative and sometimes lean libertarian. Although the Coeur d'Alene area has experienced recent growth, southwestern Idaho has grown at a faster pace. North Idaho has not elected a governor since the re-election of Cecil Andrus (D) in 1974. Andrus, an Oregon native, was a resident of Orofino when first elected in 1970. (Boise was his residence during his later campaigns of 1986 and 1990). The most recent member of the U.S. Congress from the Panhandle is Compton I. White, Jr. (D), last elected in 1964. The North Idaho region is most noted for silvaculture, the growing of trees and the production of lumber through the regions 12 lumber mills. The production of grass seeds and hops for beer production are also significant. Nine microbreweries have brewing operations in the area, making North Idaho highly characteristic of the Pacific Northwest. There are also many cattle ranches for raising beef. Idaho Panhandle Facts for Kids. Kiddle Encyclopedia.